Learning how to make cream cheese pie recipes you will see they have the same texture of the cheesecake recipes, both being made with some type of cheese. 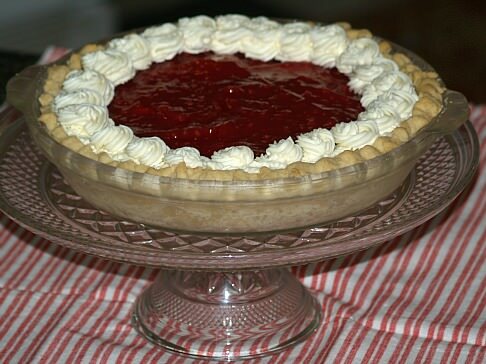 The pies as with other pie recipes are usually prepared in a pie shell making the product thinner than a pie like the recipe for New York Cheesecake. The cheese pie takes less time to bake and is more moist than some of the thicker cheesecakes. Many people prefer to learn how to make the cream cheese pie recipe with the thinner slice due to the richness. Although cream cheese pie recipes (or cheesecake) have been around since ancient Roman times, they only became popular here in the United States in the 1960’s. As a child I never knew about cream cheese pie recipes or cheesecakes. 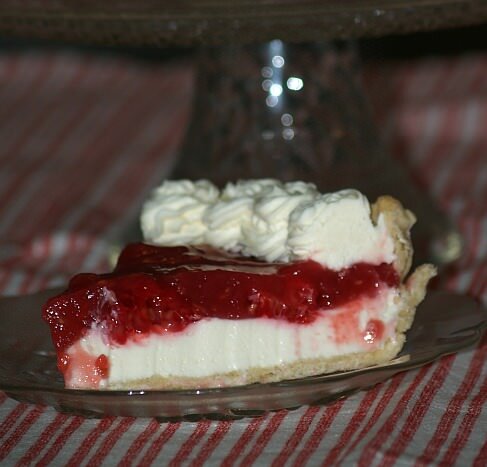 I learned how to make cream cheese pie recipes, the thinner version, when I was very young. It was so delicious and not as rich as many of the cheesecakes like the Peanut Butter. I still make this recipe today and serve it topped with fruit. A variety of different cheeses can be used in the making of cheesecakes or cream cheese pie recipes. We mainly use cream cheese here in the United States. In other countries it is common to use other cheese like ricotta. Also I want to mention that we usually think of cream cheese pie recipes as luscious desserts but they do not have to be desserts. A cheese pie can also be made without sugar; more of a breakfast pie and maybe include meat with different types of cheese. These also are very delicious. Beat together cream cheese, powdered sugar and whipping cream. Spread cheese mixture over the bottom of cooled crust; refrigerate until cold. Reserve half of the raspberries and set aside. Mash the remaining berries and stir in sugar. Let berries stand for 1 hour; sieve the berry mixture. In saucepan combine pineapple juice and cornstarch; stir in the sieved berry mixture. Cook and stir mixture over medium heat until bubbly and mixture thickens. Spread ¾ of the cooled berry mixture over top of the cold cheese pie. Arrange reserved whole raspberries over the top of pie. Spoon remaining cooked berry mixture over top of the whole raspberries. Chill at least 2 hours or until set. Garnish with whipped cream and extra berries. Unlike the cream cheese pie recipes, the cheesecake recipes have more cream cheese in the recipe and are much thicker. Combine the crumbs, sugar and melted butter; mix and press into a 9 inch spring form pan. Bake for 10 minutes. Increase oven temperature 450F degrees. Beat the cream cheese, sugar and flour with electric mixer on medium speed until well blended. Add eggs one at a time beating well after each. Blend in the milk and vanilla; pour over the crust. Bake 10 minutes. Reduce oven temperature to 250F degrees and continue baking 30 to 35 minutes or until set. Loosen cake from rim of pan; cool before removing rim. Refrigerate until cold. Stir liqueur into cherry pie filling and top cheesecake before serving. Combine and mix together cream cheese, cornstarch, milk and mayonnaise; mix until smooth. Add beef, ½ cup shredded cheese, onion, green pepper and ripe olives; season with salt and pepper. Pour mixture into unbaked pie shell; top with remaining shredded cheese. Bake at 350F degrees for 40 to 45 minutes or until set. This Mexican cheesecake recipe is a delicious cream cheese pie recipe for an appetizer; make half of recipe for a pie or use full recipe in spring form pan. Spray 9 inch spring form pan with vegetable spray. Combine ground tortilla chips, melted butter and flour; mix well and pat onto the bottom of pan. Bake 10 minutes to set; remove from oven. Beat cream cheese and sour cream with electric mixer until smooth. Beat in eggs one at a time blending well; add seasonings and mix in. Pour mixture into prepared pan and spread evenly with spatula. Bake until firm about 35 to 40 minutes. Remove from oven and cool completely; cover and refrigerate. To serve remove sides from spring form pan and place cheesecake on serving tray. Spread salsa over the top to serve. Serve more salsa and chips with cheesecake. This chocolate cheesecake recipe is a very easy cheesecake recipe to make. It is larger than cream cheese pie recipes but once you taste it you will be glad it is larger. Combine and mix together all ingredients; spread in greased 9 X 13 inch baking pan. Bake crust at 350F degrees for 15 minutes; let cool. Mix cream cheese and sugar together and beat in with 1 container of Cool Whip; spread over cooled crust. Beat pudding with milk; spread over the cheese. Top with remaining container of Cool Whip; sprinkle with nuts. Combine cream cheese, 1/3 cup sugar, salt, 1 teaspoon vanilla and 1 egg. Beat on medium speed until well blended; spread in bottom of pastry lined pan. Beat on medium speed just until blended. Gently pour mixture over pecans; bake 35 to 40 minutes or until center is firm to touch. Set to cool to room temperature; refrigerate. FOR FILLING beat cheese until creamy in mixing bowl. Add remaining ingredients; beat until well blended and smooth. Pour cheese mixture into unbaked graham cracker crust; bake for 25 minutes. FOR TOPPING combine ingredients and blend well. Spread topping over cheesecake; return to oven for 5 minutes. Cool on rack to room temperature; refrigerate until cold. Combine and mix sugar, cottage cheese and eggs; stir in the salt. Blend in the milk and cream; pour into unbaked crust. Sprinkle nutmeg over the top; bake for 25 minutes. Cool on rack; store in refrigerator. FOR CRUST melt butter in medium skillet; stir in flour, coconut and brown sugar. Cook and stir mixture over low heat until deep golden brown about 15 minutes. Using back of spoon press warm mixture in bottom and on sides of pie plate (9 inches). FOR FILLING combine cheese, orange juice and canned milk in large bowl. Beat mixture until creamy and smooth; stir in the pineapple. Spoon filling into cooled crust; cover surface with plastic wrap and refrigerate 8 hours. Serve with whipped cream if desired; store in refrigerator.